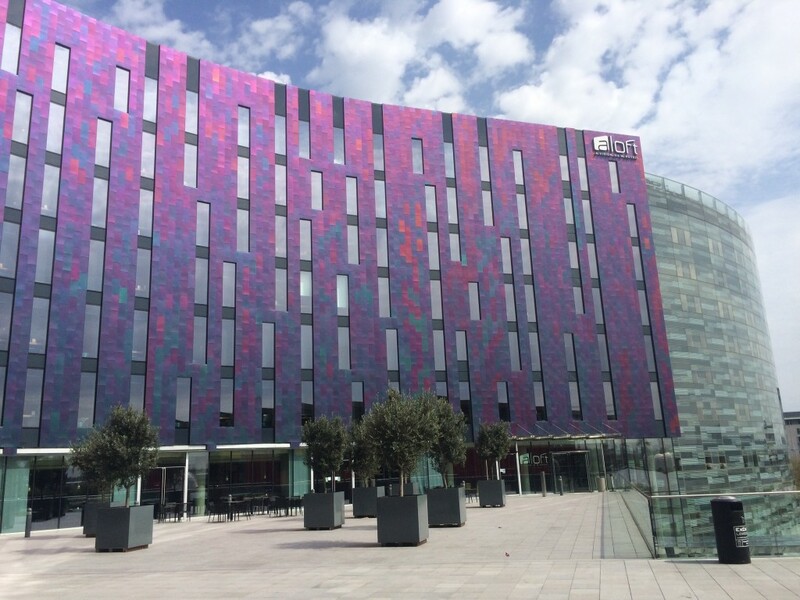 This is my review of the Aloft hotel at the Excel centre in East London. The Aloft website is here if you want to find out more. When Starwood invited me to try out the SPG Suite at the O2 last week, they also offered me a free room at the Aloft London hotel at Excel. Whilst I live in London, I had never stayed at an Aloft before so I thought I would give it a try. I was impressed. Aloft is, as I see it, a budget lifestyle brand. Whilst there are over 100 Aloft hotels now, only four are in Europe – one in Belgium, one in Turkey, one in Liverpool (an excellent Category 2 redemption) and this one. What do I mean by budget lifestyle? Well, there is no room service and no mini-bar, although there is a fridge. Instead you get a shop just off the lobby where you can buy food, drink and coffee 24 hours a day (see below). When the bar closed at night, we simply walked 20 feet to the shop and bought some beer there, taking it back to the bar to drink! 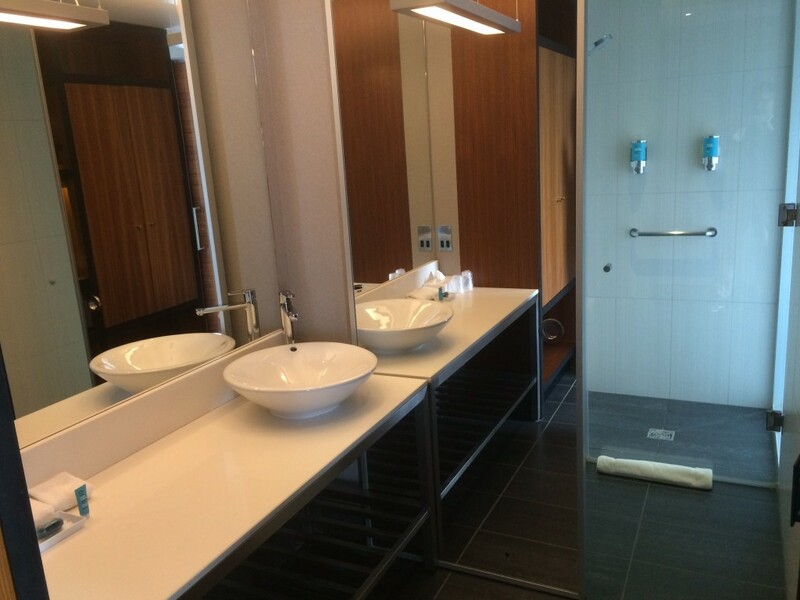 Aloft is not short on amenities. The ‘modern’ essentials are included – wi-fi and fixed line internet is free, you get decent quality Bliss toiletries and there was both a kettle and a coffee machine in my room. This is a long way away from the Holiday Inn Express model. There is a cool-looking bar which has live bands a few nights a week – not something you usually associate with a ‘no frills’ property. 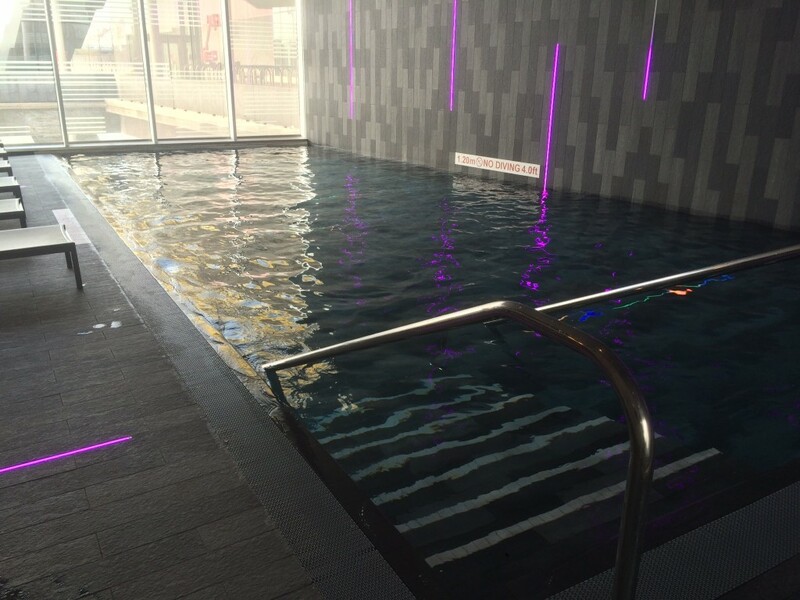 Aloft London Excel even has a swimming pool – a very funky looking pool as you can see – and a large gym. This hotel actually has plenty of ‘frills’ when you get down to it. As you can see, it is well furnished. Here is the surprising bit – last Friday, this suite was selling for just £149. A standard room was £95. Where else in London can you get a suite that would sleep a family in a hotel with a swimming pool for £149, the day before arrival? Unlike most low-cost hotels, Aloft also has a smart-looking restaurant called Fede although I didn’t try it out. On Friday, instead of sitting down for a restaurant breakfast, I decided to save time by grabbing a box of cereal and a cappuccino from the shop in the lobby. In terms of transport, the hotel is roughly 60 seconds walk from Prince Regent station on the Docklands Light Railway. Do not get off at Custom House for Excel which is at the western end of the complex – the hotel is at the eastern end. You are just three stops from Canning Town where you can transfer to the Jubilee Line. It is worth adding that the hotel is very, very close to City Airport. I had a plane flying past my window every five minutes or so. Soundproofing is fantastic, however, and you will not be disturbed by the aircraft. In terms of a Starwood Preferred Guest redemption, the hotel is 10,000 SPG points per night. My target value for an SPG point is 1.5p so I would only use points if room rates were inflated due to an event taking place at Excel. 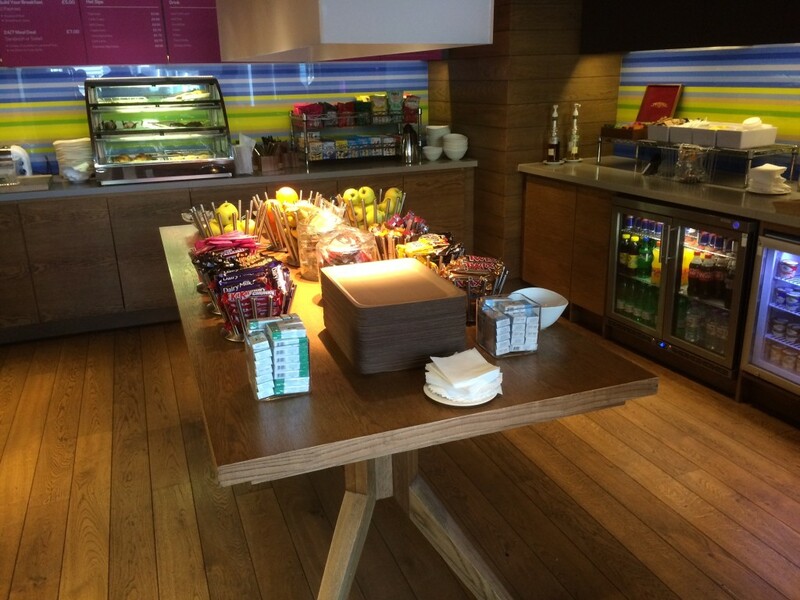 All in all, I found Aloft London to be a very sound hotel and excellent value for money. It is a massive improvement on the Ramada hotel next door when I stayed a couple of years ago. If you can make the location work for you then it is well worth considering. I would certainly be willing to stay at another Aloft property based on my experiences here. You can find out more about the hotel, and book, on this page of the Starwood website. 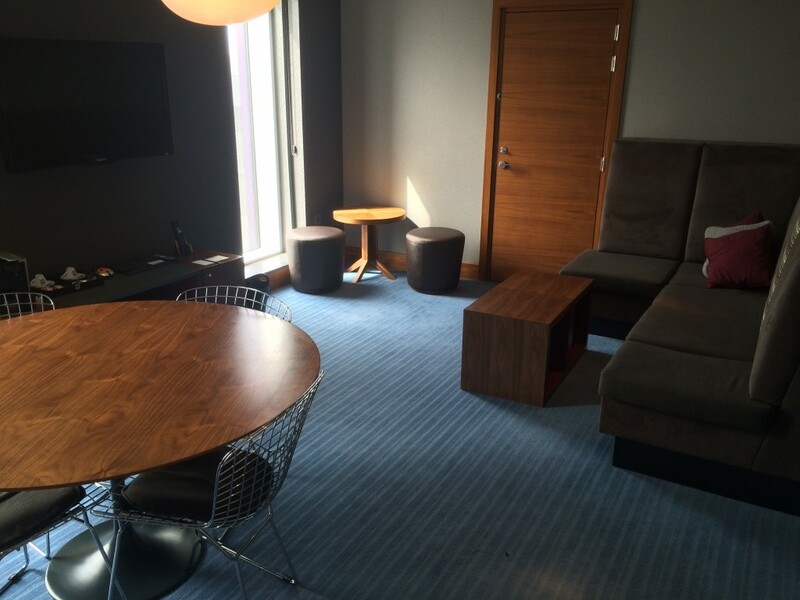 My first ever SPG stay was at the Aloft in Brooklyn and I was very impressed with it. Good location as well for Metro lines into Manhattan so a good alternative if you want to stay off the island. Also managed to get some Starpoints even though I booked through Hotels.com by ringing up the hotel in advance and attaching my SPG number to my booking. Wonder if I can swing a stay here when I have to go and visit some of my cherubs at Star Lane. Stayed here in a combined BA hotel plus flight Edi-Lcy which was cheaper than just the flight! Was well impressed – not just because we were “paid” to stay there ! What’s the best way to get from there to London City with holiday luggage? I’d walk it but you might prefer a taxi. DLR goes the long way round. Sshhh, this was my secret :). It’s my goto hotel in London most of the time. The closeness to the DLR makes up for the trek in to central London for me. 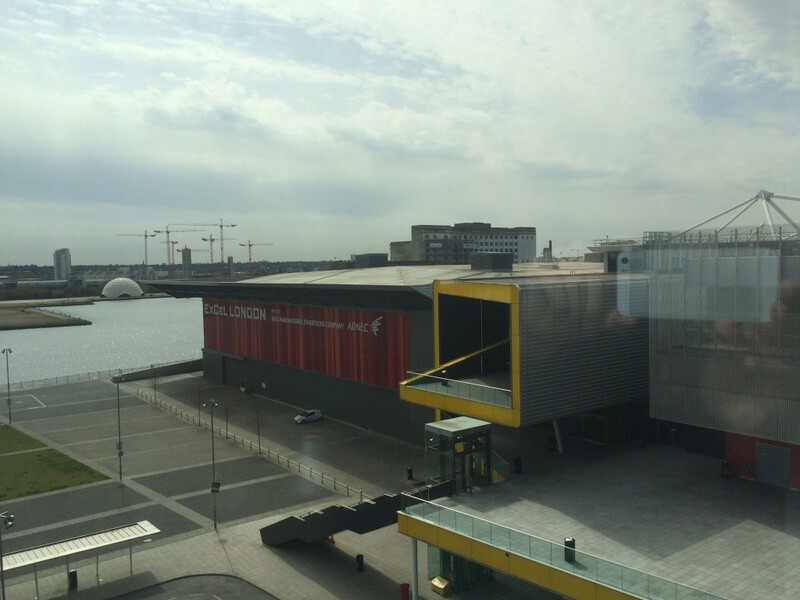 As you mention, the price can vary amazingly depending on what is happening at Excel. The restaurant used to be externally managed, but is now run by the hotel. The food there is typically of a level you would expect, but I have never been unhappy with it. Regarding other comments about getting to LCY, it is walkable but not with luggage really. I took an UberX two weeks ago from LCY, and they took me right around the bottom of Excel and back across the top again, this is *not* the correct route. It should be about a £6 fare. Obviously the airport taxis don’t like doing it. You can also take the DLR and double back on yourself, but it isn’t worth the hassle. Damn! I was exhibiting there at the weekend and was there on Friday! Missed the chance for a beer. Let me tell you a story. When I put a photo on Instagram from the concert, a friend emailed me to say that two mutual friends were in the KPMG Suite. I popped round there after the show and they were there. They were ALSO at the Aloft – one had the suite next to mine! However, I only found out later that this guy who emailed me was ALSO at the Aloft on Thurday night! He didn’t mention it because he assumed I was heading home and not in a hotel. I think a lot of frequent flyers use it as a way of building up SPG nights to keep their status. The bed looks like a kingsize? I always seem to get double beds when I stay at Holiday Inn or HI Express; not good when we’re used to sleeping in a superkingsize! At the weekend we stayed at a HI and were upgraded to an exec room with Jacuzzie and huge bathroom, but the bed was still a double! Yes, it was a big bed. Although, to be fair, we have a king at home so it is always a bit of a squeeze when we end up with a double. No space to add a wandering child in the middle of a night in a double either! I’ll give this a go on Thursday prices permitting! I used to stay here quite a bit a bit as the parking used to be free (isn’t now but it isn’t ridiculous) and I could visit clients in Midlands or Kent and then stay there to go into London on DLR/jubilee for a meeting. It is quite decent. Usually quiet. You get free cocktails as a platinum (maybe gold as well) and they are very nice. A lot of crew (french or swiss?) and passengers I assume from London City . From some rooms you have a great view of the planes. I prefer the rooms to the suites. The suites are just space- they don’t have any additional amenities from what I recall. Oddest experience. Going to bed in the hotel and waking up in a Ghurka security area with screening as it was an Olympic hotel. They had given me a note on check in which I had ignored. Looked out of window 1st thing to soldiers with guns and a lockdown- through there had been a military coup- then remembered I wasn’t in Asia! 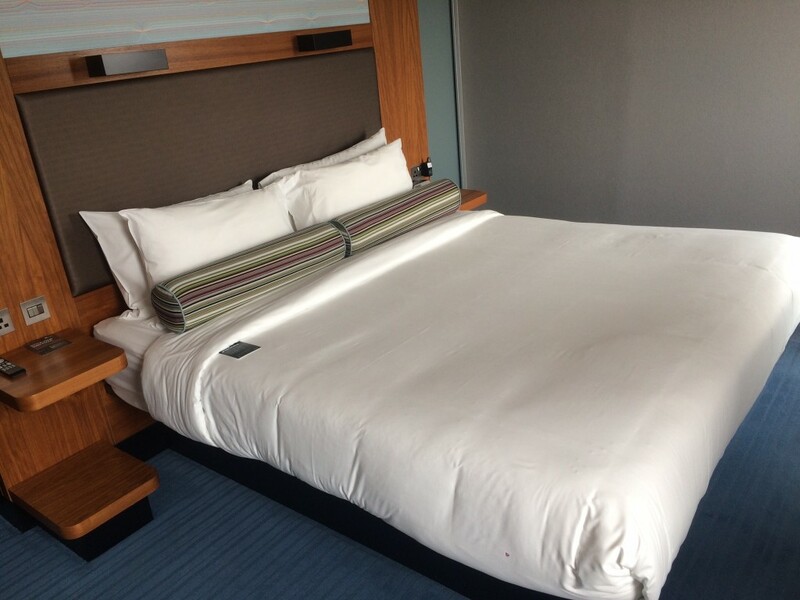 This is a very good hotel at a great price point and easy access for meetings in Canary Wharf. My only complaint is that there is no free shuttle bus before 17:30. Pool and steam room/sauna are great. Don’t forget to ask reception for a locker key.